In today's world, a reminder of the goodness of God and the love He has for His children is paramount in maintaining a faith that can withstand every test. Pastor Jeff Schreve is one of the featured contributors to a new and inspiring 52-week daily devotional book, GRACE, HOPE, AND LOVE. 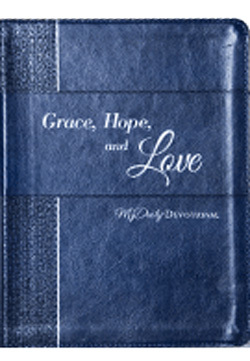 This new leather-bound resource will give you the opportunity to rest in the truths of God's Word each day of the year as you read about His abounding grace and love that offers hope to all who receive them.